Apparently Mike Myers has got some people upset. And not just those who sat through Austin Powers in Goldmember. 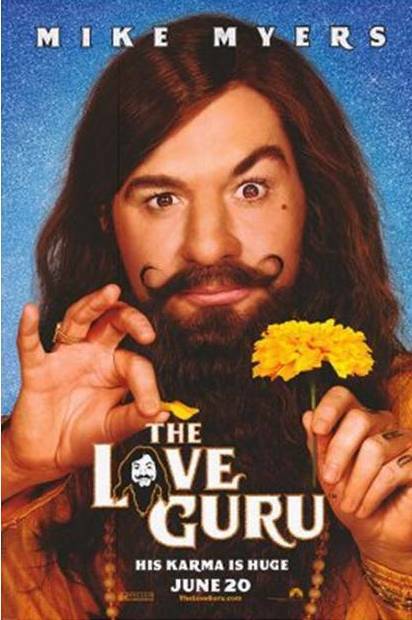 Myers’ new movie The Love Guruhas him playing a wacky Hindu guru with a wacky accent doing wacky things. And it’s got some people calling for blood. Deepak Chopra, famous spiritual guru, has stood up for Myers and has called for those protesting to pull their heads in and wait until the movie actually comes out before they grab their pitchforks. You can find the article here in the Sydney Morning Herald. But what does this have to do with Christianity? It’s interesting to see how religious groups respond to perceived negative portrayals of their faith. I remember when the movie Dogma came out and had armies of Roman Catholics protesting the movie unseen. Or the Islamic riots after a cartoonist dared to mock the prophet Mohammad. Different groups react to these depictions in different ways. The leader of the Hindu protests against Love Guru believe that this movie will stereotype their faith and give outsiders a negative view. Chopra counters that this movie will bring the Hindu faith to the attention of those who know nothing about it. And that it’s okay to have a laugh every now and again. How should Christians respond to depictions of our faith in the media? How should we react to the Pop Culture Christ? Should we stop any portrayal that shows Jesus in a bad light because it is disrespectful and will put a false view of our saviour in the mind of outsiders? Or should we embrace it because it brings Jesus into the spotlight and enables us to talk about him? A lot of times, the Jesus that appears in the media echoes the Jesus that is already in the head of the general public. Jesus appears as a long haired hippy on TV because that’s how he appears on the TV’s in people’s heads. By bringing this false Christ into the spotlight, we have something to fight. By giving us a concrete image that we can touch and see and feel, the media is giving us an opponent that we can actually hit. It’s much easier to attack a character in a movie than it is to attack a vague idea or feeling. And sometimes, Christians need to stop taking themselves too seriously. Jesus loved a joke. Try reading the Gospels without hearing Jesus use exaggeration, sarcasm or irony. Jesus spent three years hanging out with a bunch of guys. Surely he would let a cracker of a joke out on occasion (definitely a clean joke). While I disagree with the Jesus that appears in South Park, I think it can be pretty funny. There’s a scene at the end of one episode where the town has spent the entire episode trying to be politically correct about “The Holidays”. After the credits have rolled, Jesus is sitting alone in a decorated room singing “Happy Birthday To Me” all by himself. Dead funny. We need to laugh when something is funny and true and not be so humourless about our faith. I say bring on the dodgy Jesus. I say let the media throw every ill conceived and false Jesus onto our televisions, movie screens, computer monitors, radio stations, mp3 players and magazines. Let’s see what they’ve got. Let them get it out of their system. But as they do it, we need to prepare to fight. We need to stand up and point the spotlight on this Pop Culture Christ. We need to pull him apart and show him for the fraud that he is. And while we do it, we need to show that the Jesus of the Bible is real and powerful and relevant. The Apostle Peter said “But in your hearts set apart Christ as Lord. Always be prepared to give an answer to everyone who asks you to give the reason for the hope that you have” (1 Peter 3:15). Be prepared to give an answer. Know who the real Jesus is and why you have hope in him. And when the opportunity arises, share the real Jesus. Show the world that we can take a joke. Show the world we have a sense of humour. And show the world that their Pop Culture Christ is the real joke. Interesting that you mention the South Park version of Jesus, as this has to be one of the oddest depictions of Christ in the secular media today, mainly because it is so much more accurate than any of the others. Here we are presented with a Christ who is acknowledged as having died for our sins, can be called on to help in times of crisis (albeit, in a limited capacity) and who is clearly resurrected. Of course, He’s not shown to have ascended into heaven or to be reigning as Lord over all things, but it’s still a far cry from the various spot gags and cheap shots He is subjected to in shows like Family Guy, or even The Simpsons. One of the biggest errors with the South Park version is probably one of the least noticed : if Jesus is resurrected and not ascended, then the Holy Spirit cannot have been sent, so how is it that there are churches in South Park? While I agree with your comment about the Holy Spirit, I can think of many liberal and incorrect theories why there are Churche’s in South Park. I won’t go there however because I think you’re right and I don’t want to help the cause of misinformation any.